Pet Nannys is operated by Dogs On The Farm & Cats Too and promises the same quality pet care and customer service. Dogs On The Farm has a permanent physical location in Middletown, allowing pet owners peace of mind their pet is being cared for by a reputable business, and if their primary pet sitter is sick another trained pet sitting professional will be on call to fill in. All screening and training is done by Dogs On The Farm & Cats Too. Pet Nannys are insured, bonded and covered by workers compensation insurance to protect your home owners insurance. All Pet Nannys pet sitting services include daily web updates and pictures of your pets, so you can check in while you’re away from home. Pet Chatz is now available by reservation so you can see the action live, interact with your pet and even give him a treat! Pet Nannys is a complete in home professional pet sitting service performed by trained professional caregivers. Pet Nannys’ services are customizable and combinable to create a care package perfect for your unique pets. Now you can add PetChatz to your pet’s Pet Nannys vacation visits to enjoy interacting with your pet from afar! $10 by appointment or $20 per day. 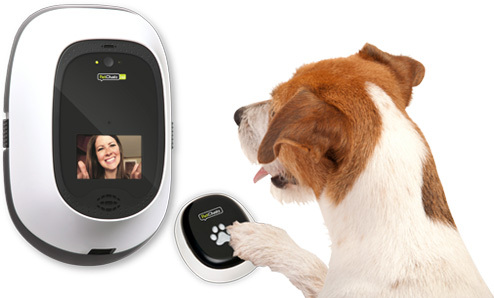 PetChatz® is a first-of-kind Greet & Treat® videophone that allows pet parents to remotely have physical interaction with their pets from anywhere. With PetChatz, you can see each other, hear each other, speak to each other, provide a comforting scent and give your pet a treat from anywhere in the world with a smartphone or computer. Learn more about how PetChatz works and explore and additional services. Walk around the neighborhood or play time in yard. Home security measures: lights on/off, drapes open/close, collect newspapers and mail, trash to the curb, watering indoor plants, and more by request. 10:00pm – 7:00am overnight stay at your home. Evening and morning bathroom breaks. Unlimited 24/7 pet sitting, pet taxi services, field trips, and errands. Available on a limited basis by advanced reservation. 1 hour fun walks in the park or at the beach. Includes transportation. Trips to the veterinary office, grooming salon, Dogs On The Farm doggie daycare, and other locations. Add $5 for additional dog, $3 for additional cat. Add $5 weekend visits, $10 holidays. Holidays include: New Years’ Eve, New Years’ Day, Easter, Memorial Day, July 4th, Labor Day, Thanksgiving, Christmas Eve, and Christmas Day.